Narrowing utilities are a wonderful way of increasing productivity. I have a few workflows using Emacs's Helm framework. There are great productivity boosters like Alfred and Quicksilver for macOS, with batteries included. If you're a tinkerer, you'd enjoy the powerful Hammerspoon. 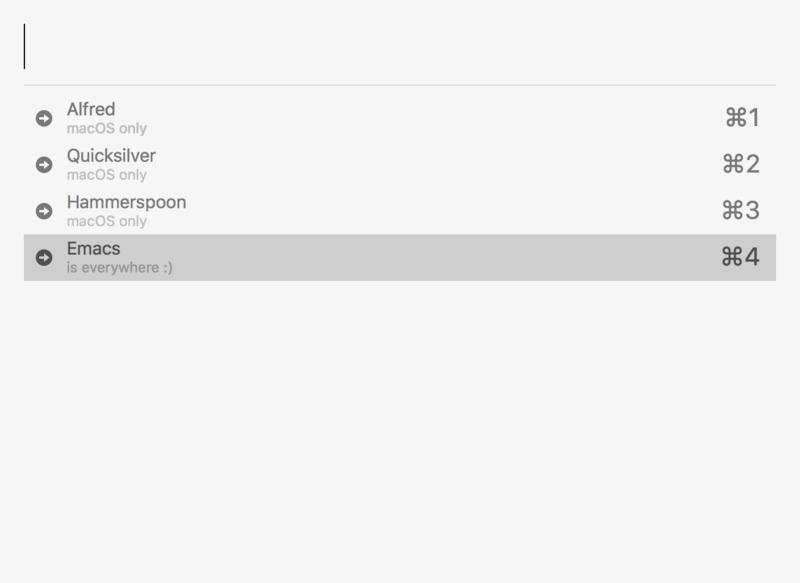 Like elisp gluing all things Emacs, Hammerspoon uses Lua to glue all things macOS. You can build your own narrowing utilities using chooser and a little Lua. Howard Abrams's post on Capturing Content for Emacs inspired me to look at gluing Emacs and macOS to launch my own cross-platform narrowing utilities. 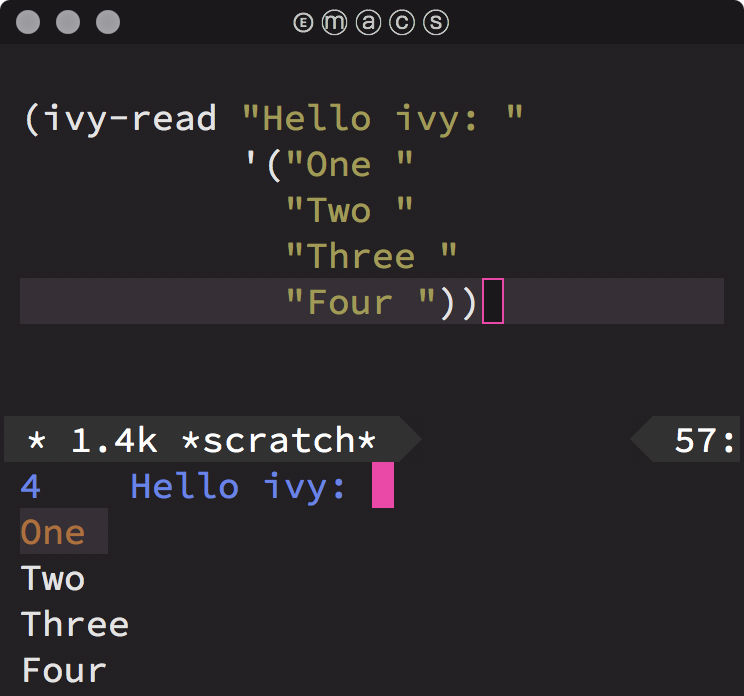 I've also taken this opportunity to look at Oleh Krehel's wonderful completion package: Ivy. We can use it to build a macOS narrowing utility. Ivy is remarkably easy to use. Turns out, ivy-read is all you need. A simple Emacs completion can be accomplished with little elisp. Pretty nifty. Let's make this completion more accessible from the rest of the OS. To do so, we create a separate Emacs frame and make it pretty. We also want it to interact with the OS. We'll use ivy-read's :action to invoke a tiny bit of AppleScript. Oh and we'll also use some funny quotes to tease ourselves about our beloved editor.
" Emacs: Eight Megabytes And Constantly Swapping "
" Emacs: Even a Master of Arts Comes Simpler "
" Emacs: Each Manual's Audience is Completely Stupified "
" Emacs: Eventually Munches All Computer Storage "
" Emacs: Eradication of Memory Accomplished with Complete Simplicity "
" Emacs: Easily Maintained with the Assistance of Chemical Solutions "
" Emacs: Extended Macros Are Considered Superfluous "
" Emacs: Every Mode Accelerates Creation of Software "
" Emacs: Elsewhere Maybe All Commands are Simple "
" Emacs: Emacs Makes All Computing Simple "
" Emacs: Emacs Masquerades As Comfortable Shell "
" Emacs: Emacs My Alternative Computer Story "
" Emacs: Emacs Made Almost Completely Screwed "
" Emacs: Each Mail A Continued Surprise "
" Emacs: Eating Memory And Cycle-Sucking "
" Emacs: Elvis Masterminds All Computer Software "
So where's all this going? I wrote a utility to extract all links from this page's org file and make them easily searchable from anywhere on macOS by invoking ⌥-W. The keys are bound using Lua, Hammerspoon, and emacsclient. This works well on macOS, but there are alternatives for other operating systems. These integrations look promising. They enable me to bring cross-platform Emacs utilities into areas I hadn't considered.